Hey all! 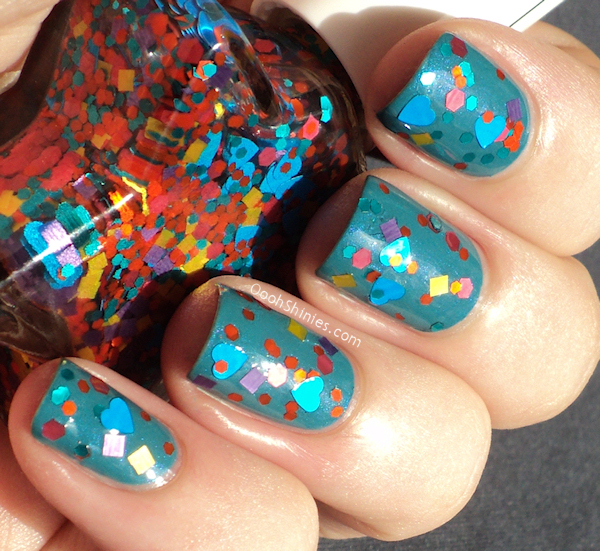 Today I have 3 polishes to show you from Indie brand JENsations. This was my first experience with Indie polish, and I'm glad to say it was a good experience :) The polishes come in this cute star-shaped bottle, and they're packed with glitter in different shapes and sizes. I found the brush a bit thin and just slightly stiff which I liked, because with bigger glitters like some of these I often end up placing them on my nails a bit instead of polishing. And that went a lot easier with this brush than the wobbly-wide brushes that some glitters have! 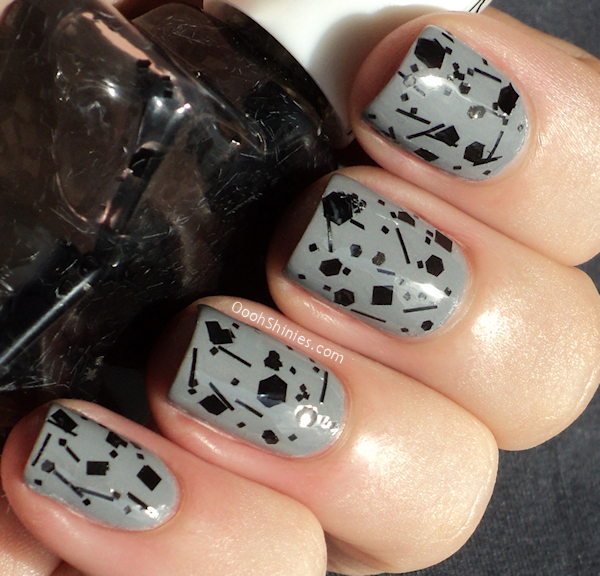 Anyway, let's have a look at the polishes! It applied fairly easy, but I did end up placing some glitters, especially the bigger ones. I used 2 coats of top coat here because I like my nails as smooth as possible. The glitters aren't thick or any, but with the placing I got a bit more of the clear base here and there, so that's why I used a 2nd coat of top coat. 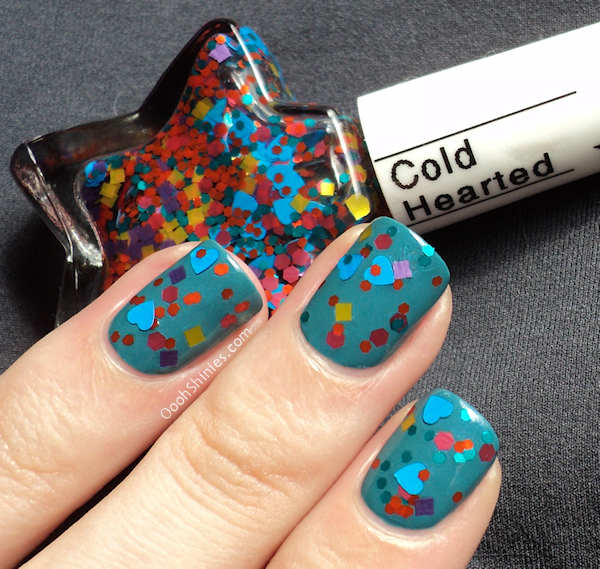 Cold Hearted has red, blue, teal, purple, yellow and dark reddish pink glitter. They're square, hexagonal and heart shaped. On my middlefinger nail I damaged the basecolor a bit, not having my day and being unpatient doesn't help when polishing! With glitters like these, that easily pile up at the tips and need to be placed a bit, it's handiest if your basecolor really is completely dry. 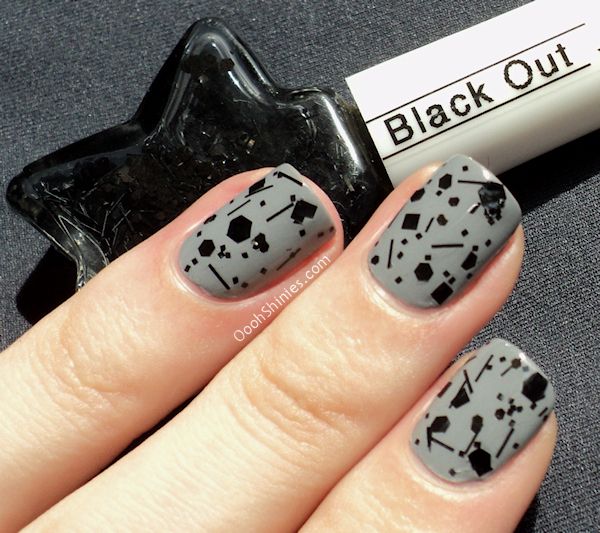 I used 1 layer of top coat on this one. I went with a teal basecolor here, but I think it would look better on a different color instead, to make the teal glitters stand out a bit more. This one's by far my favorite of the bunch. 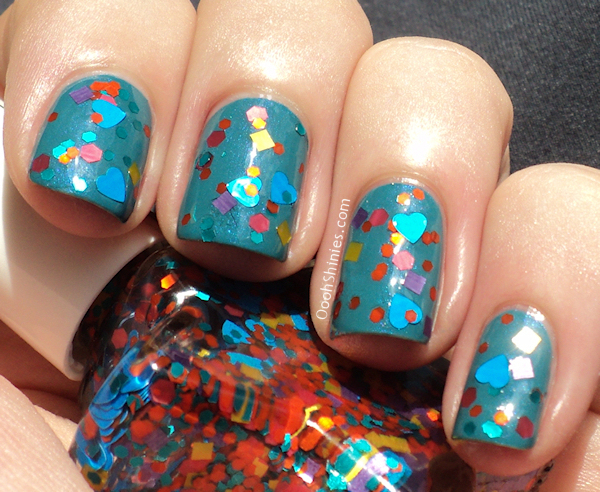 In fact, it's straight away one of my favorite glitter toppers! 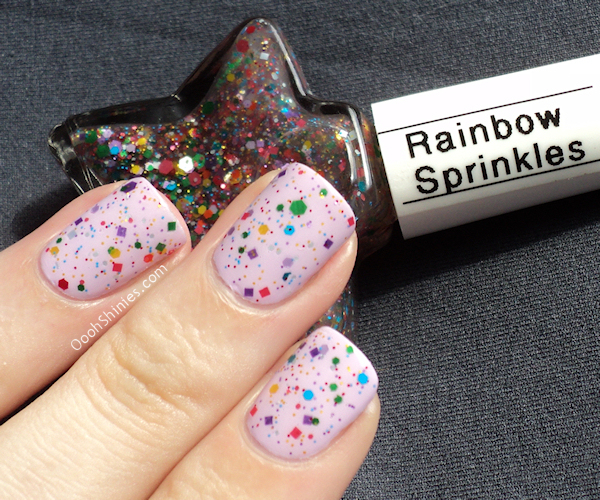 It's so colorful and cute with the tiny glitter, I'm really loving this one! As soon as I applied it on a nail wheel, it made me think of the secret level in Diablo III (I'll have to try it on a chubby unicorn purple as well, lol). If you're not sure what that is, it also made me think of a birthday party, all happy and yay, with colorful cake and party garlands - and no clowns! 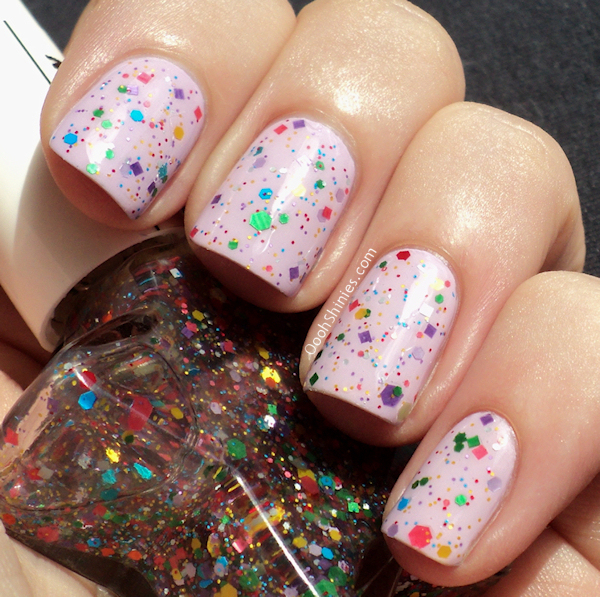 It also applied the smoothest of the 3 and barely needed any placing, most of the glitters just slide on my nails. I did use top coat here, but the polish itself dried up pretty shiny and smooth as well. 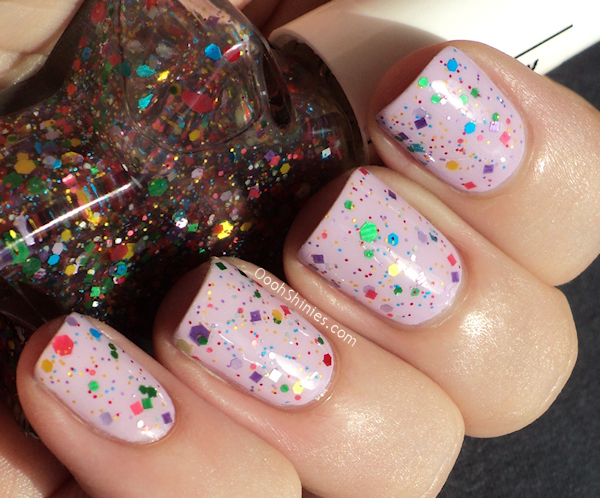 JENsations polish can be bought in Jen's Etsy store, she offers a whole bunch of different glitter polishes. Each bottle contains 10ml and costs $7,50 (€6,13).